Common sense, by definition, is familiar to us all. Science, for some of us, is more remote, yet it is not always clear what the connections are between these two ways of seeing the world. 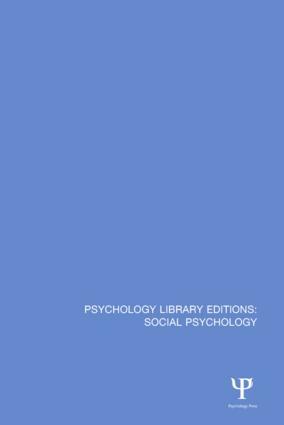 In this title, originally published in 1993, the author explores several related themes in social psychology to elucidate the way we understand the social construction of knowledge and the means by which we change social reality. From the perspective of a critique of social representations theory, the author argues that this necessitates a change of viewpoint from the individualistic and mechanistic assumptions of Cartesian science to the social and evolutionary perspective of a Hegelian framework. This not only emphasizes the cultural and historical dimensions of social phenomena but also illuminates the social and dynamic nature of individuals. As a consequence, the discipline of social psychology must itself be transformed, recognizing the active participation of scientists in the social construction of scientific knowledge. This title will be of interest to those working in social psychology, history and philosophy of science, and sociology. Preface. Introduction. Part 1: Social Representations and Common Sense 1. Building Castles in the Air: The Nature, Functions and Processes of Social Representations 2. Answering Unanswered Questions: The Individual and Society in the Dynamics of Social Representations 3. The Domain of Social Representations Part 2: Shifting Paradigms and Changing Reality 4. From the Cartesian to the Hegelian Paradigm: The Re-emergence of Societal Psychology 5. The Social Individual and the Nature of Reality Part 3: Science and Common Sense 6. The Reified and the Consensual Universes – Reality or Myth? 7. Philosophies of Science and the Sociology of Scientific Knowledge 8. Towards a Social Psychology of Science Part 4: The Transformation of Social Representations 9. A Case Study in Social Psychology. Bibliography. Author Index. Subject Index.